When it comes to eating healthy, you may wonder where butter fits in. With its short and natural ingredient list, butter certainly looks a lot healthier than other fat spreads such as margarine. But butter ends up as a food to limit on most healthy diets. If you want to eat better and still eat butter, you may need to make some food sacrifices to fit it in. It's not hard to figure out what foods make up a healthy diet. Most health organizations recommend you eat more fruits, vegetables and whole grains; make your dairy choices low-fat or nonfat; and eat a variety of protein foods that include more seafood and nonanimal sources. You should also limit your intake of solid fat, including high-fat meat and foods like butter, and instead get your fat from plant sources such as olive oil and nuts. Even though butter is a natural food made from cow's milk, it is 80 percent milk fat. Getting too much fat in your diet increases your risk of chronic illnesses such as heart disease, and adults should limit their intake to 20 to 35 percent of calories. 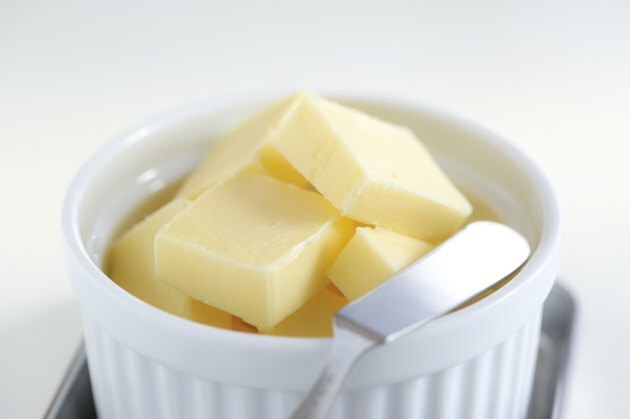 One tablespoon of butter contains 100 calories, 11 grams of total fat and 7 grams of saturated fat. Whipped butter, which is butter that has air whipped into it, is a little better with 70 calories, 7 grams of total fat and 5 grams of saturated fat per tablespoon. It's not so much the total fat in the butter that makes it so bad -- 1 tablespoon of olive oil, a healthy fat, has 13.5 grams of total fat -- but the saturated fat. Saturated fat is not an essential nutrient, which means your body is able to make enough of what it needs. High intakes of saturated fat from your diet raises LDL cholesterol levels, which is the bad cholesterol, and your risk of heart disease. The 2010 Dietary Guidelines for Americans recommend you limit your intake of saturated fat to less than 10 percent of calories. On a 2,000-calorie diet, that means no more than 22 grams a day. So, if you must have butter, you can still fit it in if you stay within the recommended limits. But that means you have to reduce your intake of saturated fat from other sources, including high-fat meat and poultry and full-fat dairy products. Using whipped butter instead of regular butter may also help you keep your intake of saturated fat down. Eating Well: Butter or Margarine? Is There a Healthy Butter Substitute? Which Has More Calories: Cream Cheese or Butter?